On July 2, Ambassador Liu Xiaoming hosted a breakfast meeting in honour of the Liberal Democratic MPs and Lords at the Chinese Embassy. 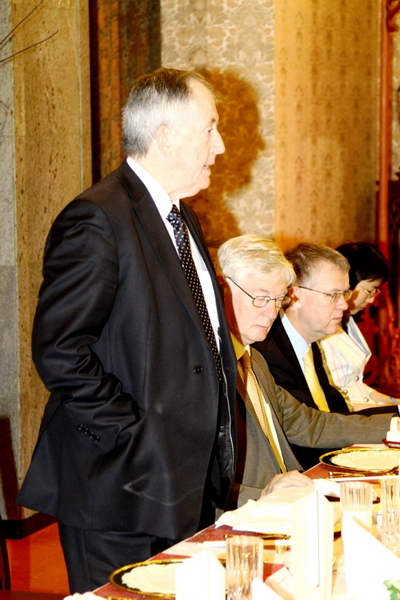 Attending the meeting were Lord McNally, the Minister of State for the Ministry of Justice and LibDem Leader of the House of Lords, Mr. Simon Hughes, Deputy Leader of the Liberal Democrats, Lord Wallace, Liberal Democrat Government Whip, Lord Clement- Jones, Vice Chair of All Party Parliamentary China Group and other Liberal Democratic MPs and Lords. Ambassador Liu said that he was pleased to see a good start in the China-UK relations after the British coalition government took power. Recently President Hu Jintao and Prime Minister David Cameron had their first meeting at the Toronto G20 Summit and reached an important consensus on the further development of the bilateral relations. This will guide the sound and stable development of the relations between the two countries in the future. China is ready to work with the UK to put the consensus of the two leaders to practice, enhance mutual understanding and mutual trust, strengthen exchanges and cooperation in all fields and promote further development of China-UK comprehensive strategic partnership. Ambassador Liu said that China places great importance on the role of the Liberal Democratic Party in British politics and has great expectations of the active role it will play in promoting China-UK relations. China hopes to have more communication with the Liberal Democratic Party by various means including strengthening party-to-party exchanges to enhance mutual understanding and trust. China also hopes the LibDem MPs and Lords will visit China to experience for themselves a contemporary China in constant change and development. Lord McNally thanked Ambassador Liu on behalf of the LibDem MPs and Lords for the invitation and said that the major political parties in the UK hold identical views on actively developing relations with China. Although the Liberal Democratic Party has rather limited contacts with China, many of its members hold a very positive attitude towards engagement with China. The Liberal Democratic Party is ready to enhance ties with the Chinese Embassy, to strengthen the party-to-party exchanges with the Chinese side and to promote mutually beneficial cooperation in the fields of justice, economy, trade and climate change. Ambassador Liu also briefed the participants on the exchanges between localities of the two countries, educational exchanges and financial cooperation and answered questions on climate change and environmental protection.